With just over two months before the NWHL's fourth regular season gets underway, teams are locking down their rosters. With 125 roster spots presumably available among the league's five teams, 56 spots have been filled as of August 3. 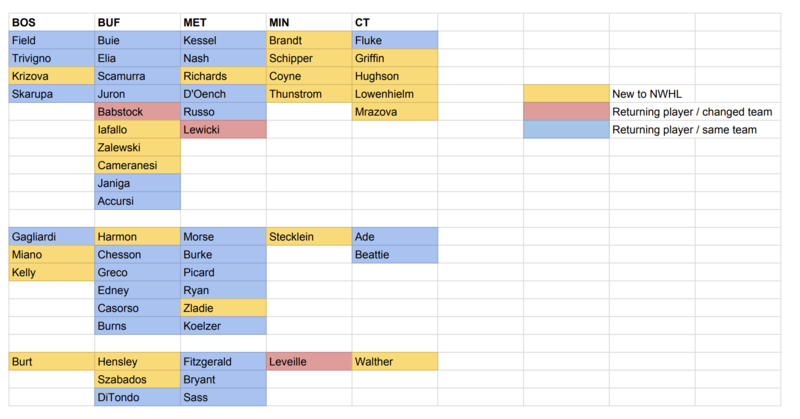 Only a few players have changed teams so far, but there are plenty of newcomers to the NWHL, including many former Minnesota Whitecaps who will join the team in its inaugural NWHL season. The Whitecaps signed forwards Kendall Coyne-Schofield and Allie Thunstrom. Both players have previously played with the Whitecaps organization. Coyne-Schofield is the latest U.S. Olympian to sign with an NWHL squad for next season. She has previously appeared in two Olympics, six IIHF World Championships and eight Four Nations Cups. Thunstrom has been away from hockey for a few seasons, as she has been competing in speed skating, but now returns to Minnesota. She previously played for the Whitecaps in the 2011-12 season and is a former player for the Boston College Eagles. She was the 2006 recipient of Minnesota's Ms. Hockey Award and began her speedskating career in 2012 -- which she plans to continue. "Speed skating has been an adventure over the last few years and I've loved every second of it, but right now hockey has to be my main focus," she said. "Hockey has been a sport that I have devoted so much to. I couldn't pass up the chance to play on the first Minnesota professional team and it wouldn't feel right not to give it everything I've got." The Riveters, despite still lacking a head coach, are slowly rebuilding their Isobel Cup championship team. The team has brought back defender Kelsey Koelzer for the upcoming season. Koelzer, the first overall pick in the 2016 NWHL draft, was named the league's rookie of the year and best defender last season. She was also co-MVP of the league's All-Star Game last season and won the hardest shot competition. Koelzer put up 14 points (5G, 9A) in 15 games with the Riveters last season. The Riveters also added Kristen Lewicki, who won fastest skater at last season's NWHL All-Star Game. She spent last season with the Buffalo Beauts, where she put up seven points (5G, 2A). "The Riveters reached out to me and gave me a fantastic opportunity to join them,” said Lewicki. “I decided it would be a great fit and I couldn't pass up the chance to be a Riveter and play in the metropolitan area." The Boston Pride have signed forwards Haley Skarupa and Denisa Křížová as well as defender Lauren Kelly. Skarupa rejoins the Pride after briefly playing with them last season before being named to the U.S. Olympic team. She notched five points (2G, 3A) in as many NWHL games last season but previously showed her offensive skill with the Connecticut Whale in the 2016-17 season. That year, she put up 22 points in 16 games. "It has been an incredibly exciting time for women's hockey after our team won gold, and this coming season will be a perfect time to continue the momentum and excitement for women's hockey and the NWHL," Skarupa said. Křížová joins the NWHL after wrapping up her collegiate career at Northeastern, where she became the sixth-highest scorer in program history. Krizova is also a member of the Czech Republic National Team. She was previously an NWHL Draft pick of the Whale. Her time at Northeastern included playing on a line with Kendall Coyne-Schofield and Hayley Scamurra in the 2015-16 season. Kelly also played at Northeastern and graduated in 2018. She notched 64 points (25G, 39A) in 140 games in her collegiate career, including leading all Division I defenders in power play goals last season. "I have been watching the Pride and NWHL since the beginning in 2015 and have been anxiously waiting for my chance," Kelly said. "I feel blessed to be given this amazing opportunity." Forward Taylor Accursi and defenders Sarah Casorso and Jordyn Burns have all re-signed with the Beauts. "We are excited to bring back three important players from last year's high-achieving team," said Beauts GM Nik Fattey. "All three work hard, are great teammates and contributed to our 11-game winning streak last season." Accursi will be entering her sophomore NWHL season. She finished her rookie year with 11 points (6G, 5A) in 15 games, including five goals in her first three pro games. Casorso and Burns will be entering their third NWHL seasons. Last year, Casorso led all Buffalo defenders with nine points, all assists. She scored her first NWHL goal in a big way, notching the overtime winner against Boston that sent the Beauts to the Isobel Cup Final. Burns has four points, all assists, in two seasons with Buffalo. She was named to the NWHL All-Star Game last season. As NWHL teams continue filling their rosters, we'll keep reporting on the signings here at the Victory Press. Also stay tuned for coverage of the NWHL Draft and previews as the season grows closer!